The Reports on Preservation and Utilization of Intangible Folk Cultural Properties was published and distributed to interested persons and organizations. This report is based on a 5-year (2006–2010) project on intangible folk cultural properties that was conducted in parallel with the study and collection of data on folk techniques. 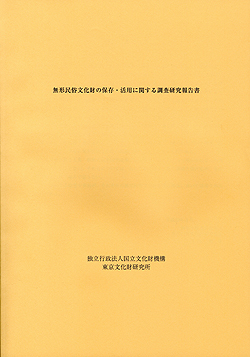 The report includes three papers regarding preservation and utilization of intangible folk properties; “A study of folk techniques and a report of results,” “Publicizing and international exchange of intangible folk cultural properties—15 years of the International Festival of Folk Performing Arts,” and “An essay on organizations transmitting folk performing arts—The present state of the hozon-kai.” A PDF version of the document in its entirety will be made available on our website. Front and back cover of Science for Conservation, Vol. 1. The bulletin has faded somewhat after about 47 years, but its format has changed little. Science for Conservation is a bulletin that reports the results of our study and research regarding conservation of cultural properties primarily from a scientific perspective. The bulletin has been published since it came out in 1964, and Vol. 50 came out at the end of March this year. 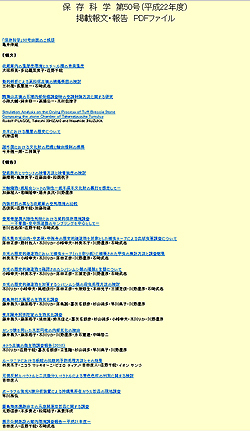 The bulletin’s history certainly reflects the history of the conservation science in Japan. When Vol. 1 came out, the belief that conservation of cultural properties required scientific perspectives and techniques was little known for the most part. Thus, the term Conservation Science was almost unknown. The term is now widely known thanks to the unceasing efforts and struggles and the passion for conservation of cultural properties on the part of our predecessors. We continue their work, and Science for Conservation will continue to strive to encourage the recognition of this science as a beneficial and essential field of academia. A limited number of copies of Science for Conservation are printed, so the bulletin is only distributed to relevant institutions. Thus, every article will be available on the Internet in PDF format, starting with Vol. 1. If you are interested, feel free to have a look (http://www.tobunken.go.jp/~hozon/hozon_pdf.html); we welcome your interest in our activities. The Japan Center for International Cooperation in Conservation began Cooperation to Safeguard Cultural Heritage in the Countries of the Caucasus as part of the Networking Core Centers for International Cooperation in the Conservation of Cultural Heritage Project commissioned by the Agency of Cultural Affairs. This year, the program will operate out of the History Museum of Armenia and teach and train personnel in conservation and restoration of metal and textile artifacts. The Republic of Armenia has a number of materials that are extremely valuable historically but cannot encourage research and conservation and restoration as expected due to the lack of financial resources, personnel, educational institutions, and information. The country craves foreign assistance to teach and train personnel in the area of protecting cultural properties. A preparatory team was sent to the country from April 3 (Sun.) – 13 (Wed.), 2011. 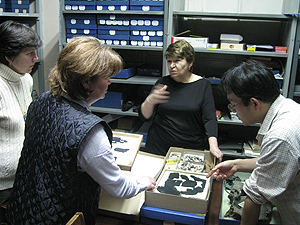 The team consulted with officials of the Ministry of Culture (which oversees museums), it inspected the History Museum of Armenia’s conservation and restoration facility and repository, and team members talked directly with conservation and restoration experts working there about specific details on research cooperation. As a result, preparations are currently underway to conclude an agreement and memorandum of understanding with Armenian representatives. Preparations are also underway to begin workshops and joint projects regarding conservation and restoration and scientific study of the metal and textile artifacts in the History Museum of Armenia.